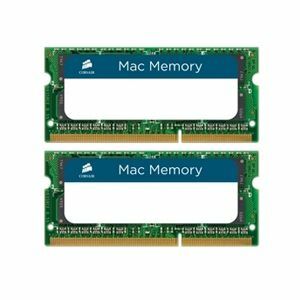 Corsair CMSA8GX3M2A1066C7 MacBook Memory Kit, two 4GB 1066MHz C7 DDR3 SODIMM modules for Apple iMac, MacBook and MacBook Pro for a total of 8GB (2x 4GB). Tested at Apple's Compatibility Labs to ensure best form, fit and function with all current products that have official Apple support for 4GB SO-DIMMs. Adding system memory is one of the most effective ways to improve overall performance and Corsair�s Mac Memory offers customers a solid solution with limited lifetime warranty. Complex Adobe graphic processing much faster, no issues what so ever.